OLD LYME - When Bikes for Kids gives a new bicycle to a Haitian quake victim, it is like giving someone a luxury car here, as it is such a precious commodity. Bikes are the sole transportation for many Haitians and some ride on bikes with only rims and no tires. Many have lost their only mode of transportation. 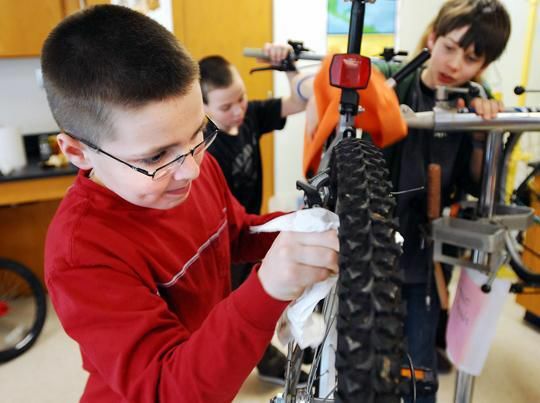 “Giving a bike to someone in Haiti, is literally like giving a BMW to someone in America,” explains Dave Fowler, a volunteer in the Bikes For Kids program, which was started in 1989 by Chuck Graeb, of Old Lyme who passed away in September. Graeb, who grew up poor in the Bronx, during the Great Depression, never had a bike as a kid. He vowed to himself has a youngster that when and if he could, he would make sure that any child who wanted a bike would have one, because he didn’t. Keeping true to his promise, Graeb gave away over 12,000 bikes to needy kids through his Bikes for Kids organization, including over 30 bikes for special needs riders. “We are just trying to keep Charlie’s dream alive,” says Fowler, of his late friend. “This organization is such a great service to the kids on the shoreline all the way over to New Haven, over to Westerly R.I and up to Middletown.” Fowler is currently working with several other volunteers, as well as his students at Old Lyme Middle School, to repair and collect approximately 100 bikes to be shipped to Haiti. “Many people in Haiti, lost not only their homes and possessions but also any mode of transportation they had. In addition, gasoline is hard to come by right now in Haiti. Residents are literally riding around on bikes with no tires, just rims, which is still, remarkably a better choice of transportation for many of them, than walking the several miles they need to for work or food,” explains Fowler of the obvious need. The collected and refurbished bikes will be shipped, via boat, to Les Cayes, Haiti, the town that many residents of Port-au-Prince found refuge in after the debilitating January earthquake, literally rocked their world. Fowler, along with other Bikes for Kids volunteers are orchestrating the bike give away with the help of Pastor Lubin Beaucejour of the Bethesda Evangelical Mission in Wallingford. Right now, Bikes for Kids needs more volunteers who have large vehicles to collect and transport the bikes to the container in Wallingford, which is slated to set sail to Haiti later this month. This past holiday season, the first since Graeb’s passing, the organization gave away seven bikes. Fowler hopes to keep this going and is currently trying to round up all the volunteers Graeb had enlisted over the years. “Many of us have never met, so we are still trying to get everyone together who wants to be a part of this,” says Fowler, who not only is working to get bikes to Haiti, as well as needy kids in Connecticut, but also wants to try to complete one of Graeb’s last hopes of having Christmas in July.